The secret to get that really fresh and vibrant feeling of your pizza salad is to use real vinegar in it and oregano. Apart from that, the other ingredients can be altered. 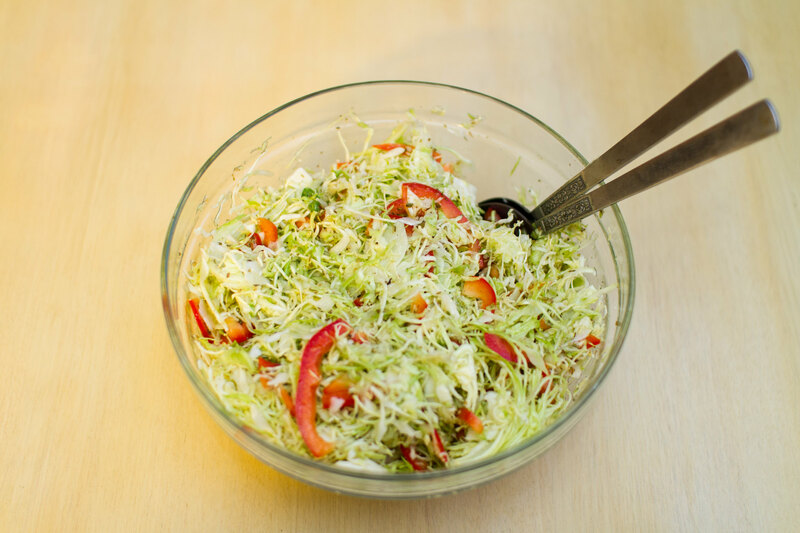 This time we used point cabbage instead of white cabbage and also added some raw bell pepper in to add some extra fibers and vitamins. Homemade pizza salad in a bowl. Mix the vinegar, water and olive oil with the seasoning in a bowl. Shave the cabbage finely and chop the bell pepper. Add to the bowl with vinegar. Toss well and leave for a while, preferably over night. We had the pizza salad for lunch with a “spinach cake”. It was supposed to be a frittata but we had ran out of eggs apparently, having only two left. But that worked as well, by whipping the eggs with some water before covering the spinach and than topped it with a lot of grated pecorino. 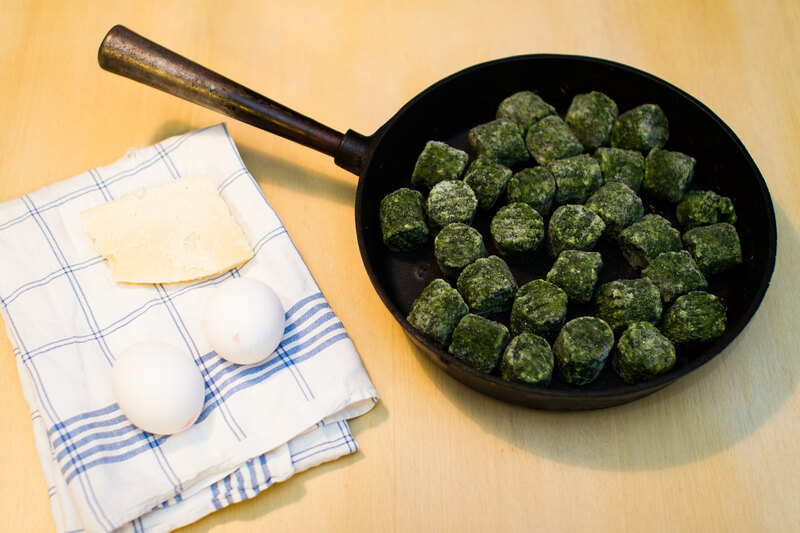 “Spinach cake” with eggs and pecorino. It is very convenient to use frozen, chopped spinach since it really is fast food and can easily be kept in the freezer at all times. Very handy. Just de-frost it in the frying pan before adding the eggs. 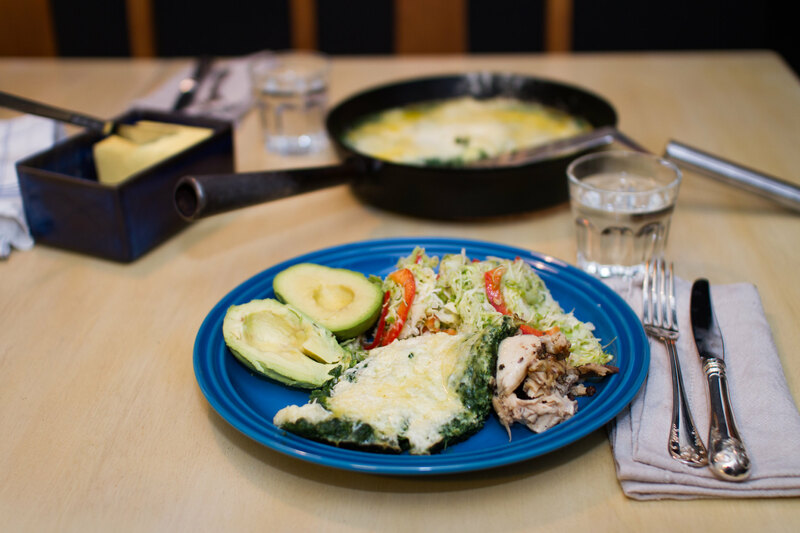 Avocado and some leftover chicken was served to the pizza sallad and spinach cake as well. 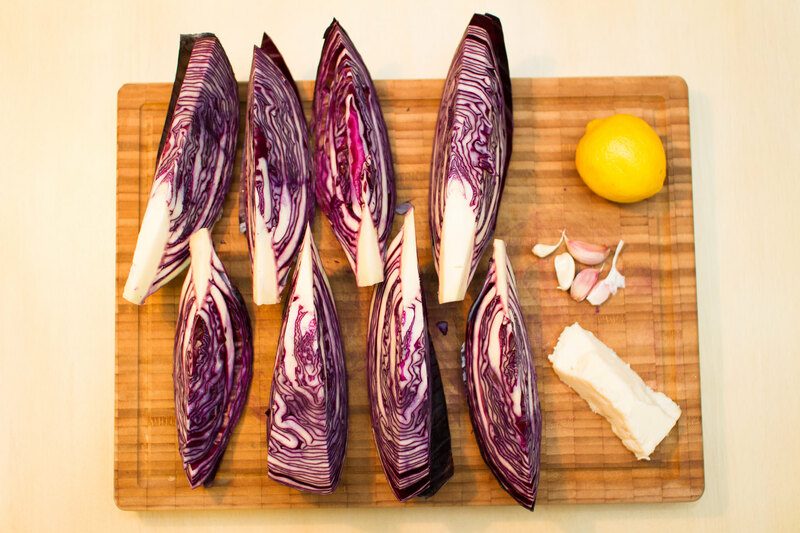 Cabbage, red or white, is almost always available in our kitchen. It’s so versatile and for this dinner we made wedges and roasted them in the oven with garlic, lemon and pecorino cheese on top! 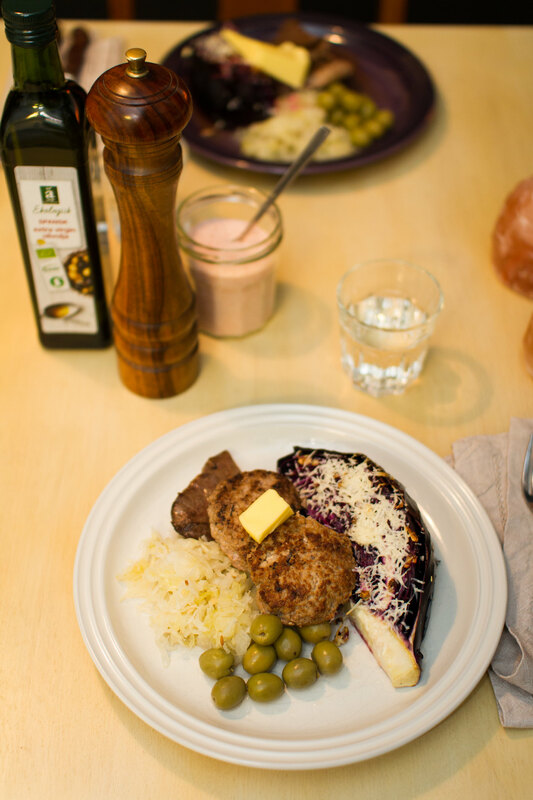 Oven roasted red cabbage for dinner. 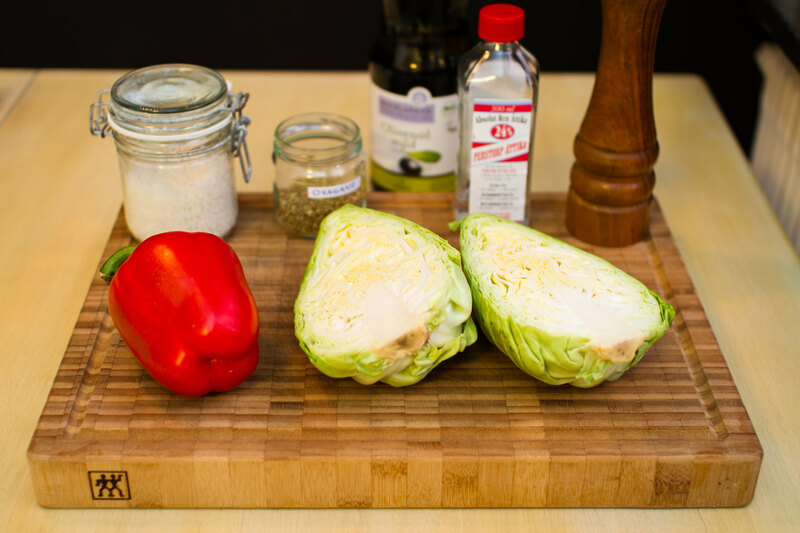 Cut the cabbage head in wedges and place in an oven ramekin. Mince the garlic cloves and zest the lemon. Rub it into the wedges. Slice the lemon and squeeze the juice on top as well. Pour some liquid coconut oil on top, add salt and pepper and place in the oven for about 40 minutes. Grate the cheese and spread on top of the wedges, put back in the oven for another 10 minutes. 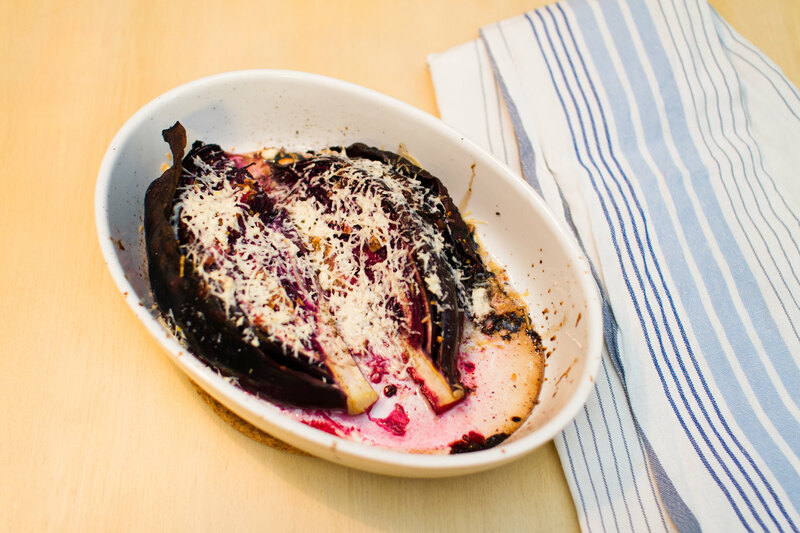 Oven roasted red cabbage with grated cheese. 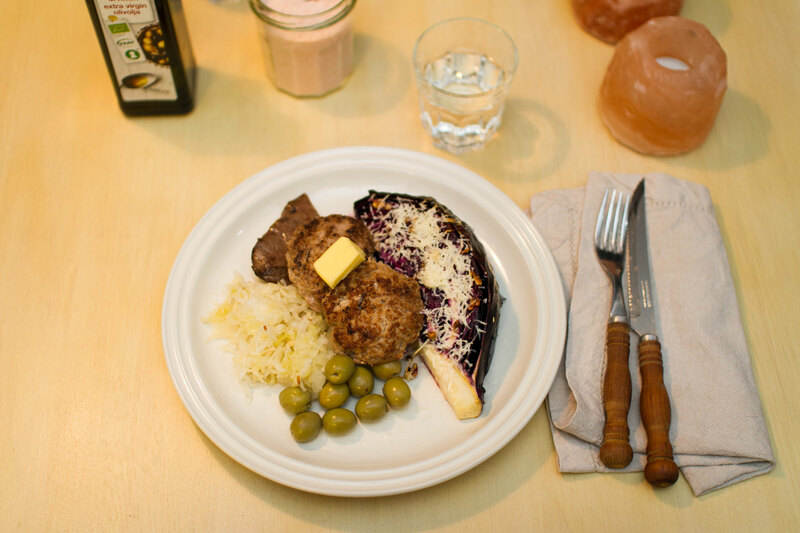 The cabbage was served with some leftover meat patties and a piece of cow’s heart, saurkraut and green olives. Top with a click of butter and some olive oil before eating!